These are Francine's false Christian ID papers that she used to hide in France. She received them at the end of 1943 in Graulhet, France. Her friend Annette's father, Monsieur Lautard, secured the papers for her. He ran the town newspaper and had access to City Hall, so he looked up birth certificates of real people who lived far away and matched their descriptions so if the Nazis looked it up, they would believe them. He made up papers for Francine, her sister, and her mother, along with many other Jewish families. 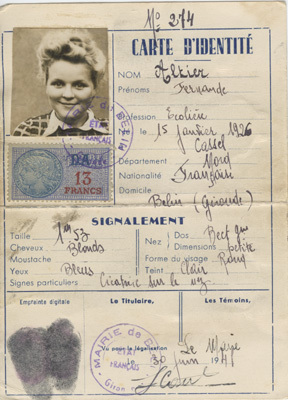 Monsieur Lautard also hid two Jewish boys, Maurice Rubinsztein, who became Annette's husband, and his Maurice's brother Jacques, because he couldn't find birth certificates to match them.